GILBERT, Arizona – Located in the Arizona desert, the Conservatory of Recording Arts and Sciences (CRAS) is an oasis for aspiring audio professionals. Established in 1980, CRAS offers a comprehensive educational program designed to prepare students for the fast-paced, challenging world of audio recording and sound engineering. 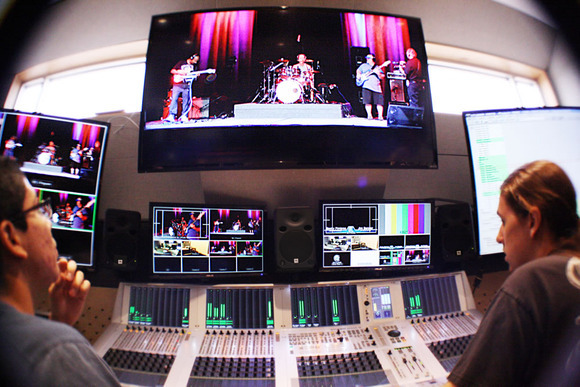 Recently, CRAS expanded its Master Recording Program to include a Broadcast Audio segment, and outfitted its facilities with world-class HARMAN equipment that includes Studer Vista digital consoles and JBL Professional LSR6300 Series studio monitors. This vision led to the creation of StuderBroadcastAcademy.com, developed in partnership between Studer and CRAS. The training program is available to professional engineers but also provides the basis of the curriculum at CRAS. Students can operate a Vista 9 consolein the audio production room, a Vista 5 in the mobile broadcast unit, or get training online at StuderBroadcastAcademy.com using the Studer Virtual Vista software. CRAS worked closely with veteran audio engineer Fred Aldous and other professionalsto help CRAS devise the approach of the Broadcast Audio segment. “Fred has been working with our instructors once a week to get them up to speed on everything, and in the meantime we’ve reached out to NASCAR, the NFL and other organizations to get connected with some A1 engineers in the field. We’re really trying to connect closely with the industry,” Brock said.